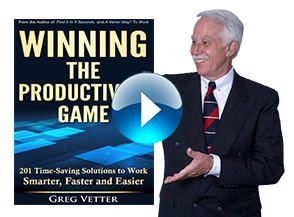 Gain Control of E-Mail and Computer Files | Vetter Productivity, Inc.
• Drowning in too many e-mails with no system of how or where to store them. • Never completely emptying your e-mail Inbox. • Scrolling over the same e-mails again and again. • Wasting time looking through old messages trying to find a file. • Having to constantly use Search due to too many folders and too much information. 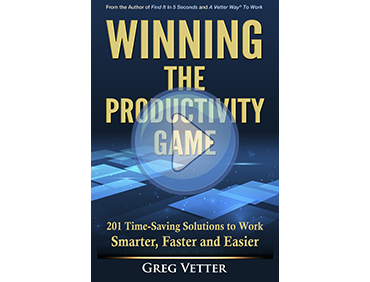 Vetter Productivity will teach you a radically new, easy, and unique way to work in the Information Age. • Hands-on implementation while in class. • Next day results with what you’ve learned. • An expeditious method that eliminates e-mail sorting and scrolling time. This is a hands-on workshop where the participants not only learn concepts but more importantly, set up their own systems in Outlook and in Windows Explorer. Participants will be able to start using their new systems the very next day. • Have your system up and running the very next day. • Cut down the time it takes to go through your e-mail by 50%. • Completely empty your e-mail Inbox. • Find items in your e-mail and computer in seconds. • Save over an hour a day in wasted time. • Structure e-mails that can be read and understood instantly. • Use the same work and storage system everywhere with your e-mail, computer, smartphone, and paper files. • A one-day, interactive program. • Participants are encouraged to bring their laptops so they can set up their system during the workshop.